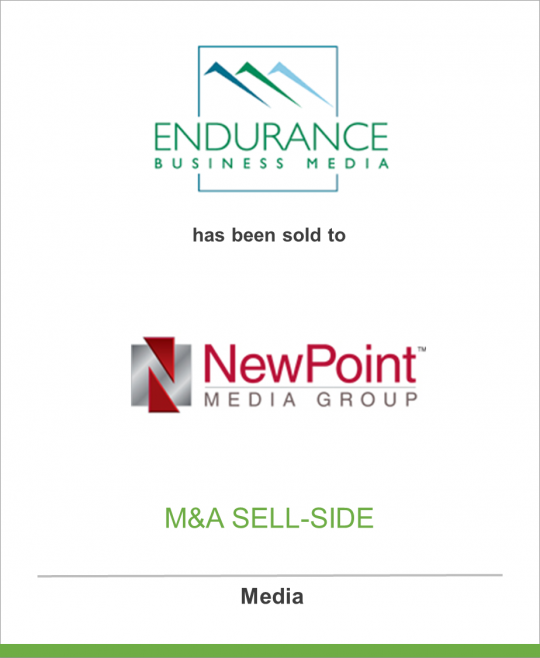 DeSilva+Phillips announces the sale of substantially all the assets of Endurance Business Media, Inc., including all print and digital assets and trademarks of Homes & Land, Estates & Homes, Rental Guide and Home Guide (collectively “Homes & Land”), to Lion Equity Partners, through its affiliate Real Estate Media Holdings, LLC (“Lion Equity”). Lion Equity is the owner of NewPoint Media Group (“NewPoint”), publisher of The Real Estate Book, New Home Finder, Senior Living Choices, Mature Living Choices, and other localized real estate related magazines, websites, and digital solutions. NewPoint and Homes & Land are the two largest publishers of local printed and online home-related magazines in the United States and Canada. Homes & Land, which is headquartered in Tallahassee, FL, is an integrated real estate media platform, providing local real estate information throughout the U.S. and parts of Canada. The Company’s high-quality, photo-rich magazines, coupled with a range of highly effective online services, provide critical information to consumers seeking to buy or rent. Homes & Land operates in 226 local markets across North America, and its online listings have a combined reach of 150 million unique visitors. NewPoint Media Group, LLC ™ (www.NewPointMediaGroup.com) specializes in targeted media solutions that include both print and digital distribution to create integrated advertising and marketing services that amplify overall effectiveness and results. Leading brands include The Real Estate Book, Mature Living Choices, Senior Living Choices, New Home Finder, New Homes & Ideas, and New Homes Journal. In addition, the Company’s Publications Print Division provides these services to a variety of industries. The Company specializes in integrating print and digital media to effectively reach and engage a targeted consumer audience through local print distribution, web, mobile, direct mail, and social outlets. Homes & Land (www.HomesandLand.com), with over four decades of real estate expertise, is an integrated market-leading media company providing local real estate information throughout the United States and parts of Canada. Homes & Land’s high-quality, photo-rich, four-color magazines, Homes & Land, Estates & Homes, Rental Guide and Home Guide – coupled with a range of highly effective online services – serve the $27.3 billion real estate advertising industry and form an integral part of the local real estate ecosystem by providing critical information to consumers seeking to buy or rent. The Company now also serves those in the market to improve residential properties and apartments, tapping into the $100 billion local advertising marketplace by opening up new advertising categories such as home improvement, contractors and home appliance sales.